Police say thieves robbed Bnei Brak apartments during Rabbi Shteinman's funeral because they knew the homes would be empty. 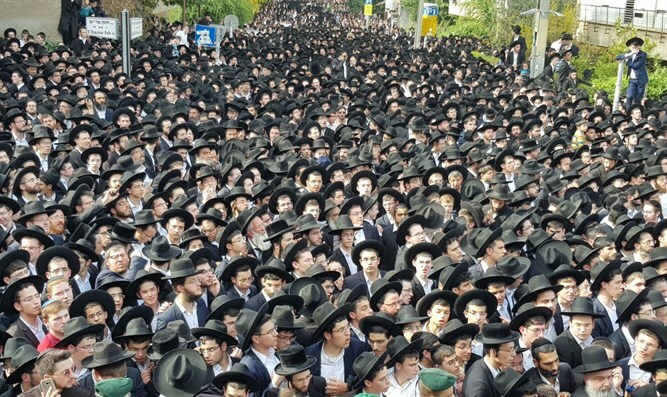 A crowd numbering in the hundreds of thousands gathered in Bnei Brak on Tuesday to mourn the passing of Rabbi Aharon Yehuda Leib Shteinman at Maayanei Hayeshua Hospital in Bnei Brak. Assuming that the apartments would be empty during the funeral, a group of burglars broke into apartments in Bnei Brak and made off with expensive jewelry and cash worth tens of thousands of shekels. Police say they arrested two of the suspects aged 23 and 30 from the Jerusalem neighborhood of Kafr Aqab after examining forensic evidence from the break-ins. They were arraigned at the Tel Aviv Mastrigate Court and were refused bail. Israel Police investigators have located some of the owners of the stolen goods, and continue to work to find the owners of the other items. "The Israel Police acts decisively against offenders who damage public property, and used both seen hidden methods that assisted in locating, arresting and bringing the perpetrators to justice," the police said.